At Symbiose, the health of your gums is of the utmost importance to us. Why? Because gum disease is among the most widespread dental problems. However, this disease often has no apparent symptoms! Gum disease can cause significant damage, even tooth loss; but our team is available to help you prevent this disease. Gum disease can develop very subtly. It actually develops due to toxins that are produced by bacteria found in the mouth. Toxins settle on the teeth along the gumline, resulting in inflamed, weakened gums. As you may have guessed, bacteria deposits cause dental plaque, which in turn, becomes tartar, further irritating the gums. Gingivitis is actually the first stage of a gum disease caused by plaque and tartar buildup. It causes gum inflammation, which, fortunately, can be easily treated. See your dentist as soon as you notice that your gums are red and swollen, that they bleed when brushing or flossing your teeth, or when you have bad breath. If you wait too long, gingivitis will inevitably lead to periodontitis. This advanced stage of gum disease can cause irreversible damage and result in bone resorption and, ultimately, tooth loss. We also have the expertise to fix gingival recession. This condition is usually the result of gum disease or a poor brushing technique. In any case, we recommend this treatment to make up for a lack of attached gingiva. But make no mistake; this condition can jeopardize the durability of your teeth! At Symbiose centre dentaire, we use the latest techniques to perform gum grafts. Autograft (gum lift) consists of grafting a layer of tissue retrieved from the patient’s palate, while allograft treatment consists of applying gum tissue obtained from a donor. 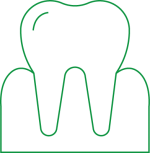 Contact us for an evaluation, if the roots of your teeth are sensitive to hot and cold foods and beverages.